Uranium was discovered back in the 18th century and the two German physicists, Otto Hahn, and Fritz Strassmann, by conducting a series of experiments, found out that energy is yielded by splitting uranium into parts. So after some research and further experiments, the use of uranium was initiated on a large scale as an immense amount of energy was dissipated in the fission. Nowadays Uranium is the primary element in the nuclear reactors, and it requires specific environments as the emitted radiations are quite dangerous. The substance is commonly used for non-radioactive purposes in the military. It is not quite flammable, but it is quite hard and dense. Due to these specialties, it is used in the military ordinance for high density penetrating artillery. Bullets made from it have the capability to penetrate even more than the normal ones. It is also used for making aircraft equipment and medical supplies. Nuclear bombs are also made from it: the United States and Russia and the largest consumers of this mineral. During the cold war, the use of uranium was increased because Russia and the US were planning on making more and more nuclear missiles for defense purposes. 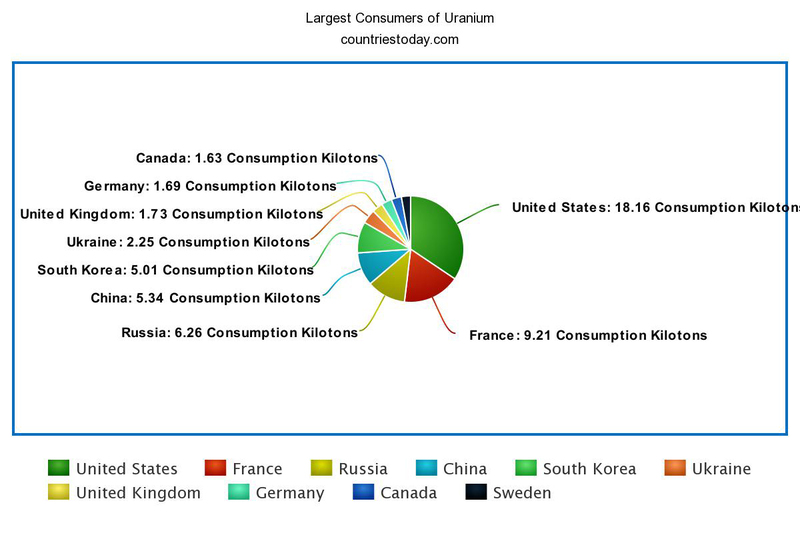 The United States is the largest consumer of Uranium as it consumes 18.61 metric tons of Uranium as per the statistics of the year 2016. Most of the uranium used by the United States is mined locally and is used for several purposes. It is used primarily in the nuclear reactors as fuel and is also used for producing electricity. France is the second largest consumer of Uranium as it consumes 9210 metric tons of Uranium as per the studies of 2016. The country consumed half the amount of Uranium US consumed. The country uses Uranium for several different purposes including electricity production. The annual worldwide consumption is almost 190 million pounds. On the other hand, the global extraction is about 140 million pounds. So that leaves us with a deficit of 50 million pounds. In the next decade, it is expected that many new mining projects will be installed. 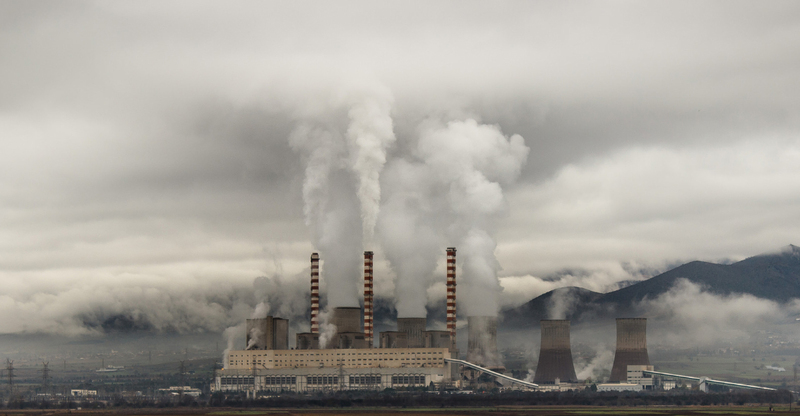 The world is now also focusing on using uranium to produce large amounts of electricity. That is why the demand is expected to increase a lot shortly. Not only that but the researchers also state that this thirst can only be quenched through freshly mined uranium. The metal is quite hard and dense and is used in the making of ammunition. It’s used to manufacture bullets that can penetrate through the thick layers of armored vehicles. Uranium is also used in the manufacturing of nuclear bombs. During the Cold War, the United States and Russia consumed large amounts of Uranium to manufacture nuclear missiles. The United States produced it’s first two nukes using uranium, The Little Boy and Fat Man which were dropped on Hiroshima and Nagasaki. Uranium is also used in some countries for producing electricity as it dissipates a large amount of energy. 2 pounds of Uranium 235 can produce almost 20 Terajoules of energy which is approximately equal to the amount of energy of 1500 tons of coal. In most of the conventional mines, there is always a mill where they crush the ore. Later it is grounded and leached using sulfuric acid to dissolve uranium oxide. At the treatment plant of an ISL operation or a mil of conventional mine, pure uranium is obtained through ion exchange. After this, it is preprocessed, dried and packed in the form of U3O8. Some mills and ISL operations also use another technique of extraction. Instead of extracting through sulfuric acid, they use carbonate leaching. The treatment process gets quite complex when this technique is implied. Adding to that uranium is obtained as a bi-product of minerals like copper and phosphate. The production industry of this radioactive mineral was quite consolidated. This was because of the takeovers, closures, and mergers. Following is a list of some of the nations that are responsible for mining out the most quantity of uranium. Almost 86% of the mineral came from these companies. 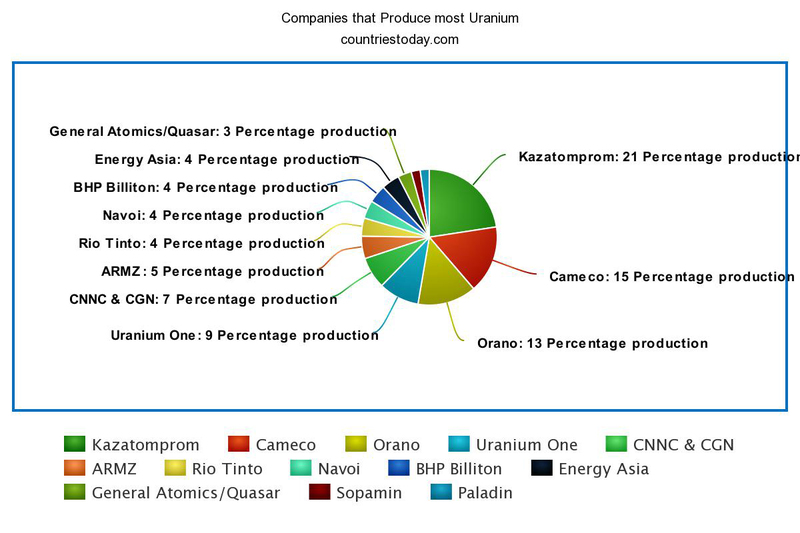 Down below is a list of countries which produce the most amount of Uranium. Kazakhstan is the largest producer of Uranium as per the statistics of the year 2016. 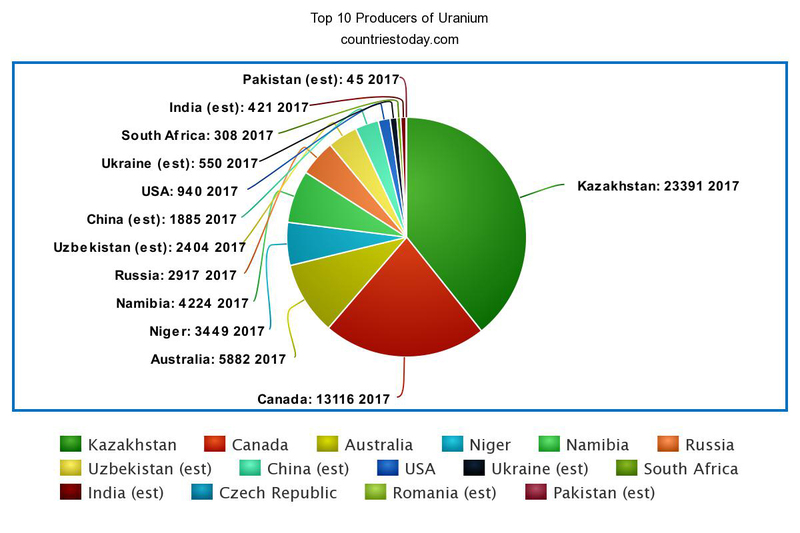 The country produced about 24600 metric tons of uranium in 2016. The second largest producer in Canada as it produced 14000 metric tons of Uranium in 2016. The demand for Uranium is quite high because it is used as a fuel in nuclear power. As per the studies of the Institute of Geosciences and Natural Resources in Germany, Kazakhstan is the largest producer and exporter of this. It is basically a Central Asian country, and it produced about 24,600 metric tons of uranium in one year. 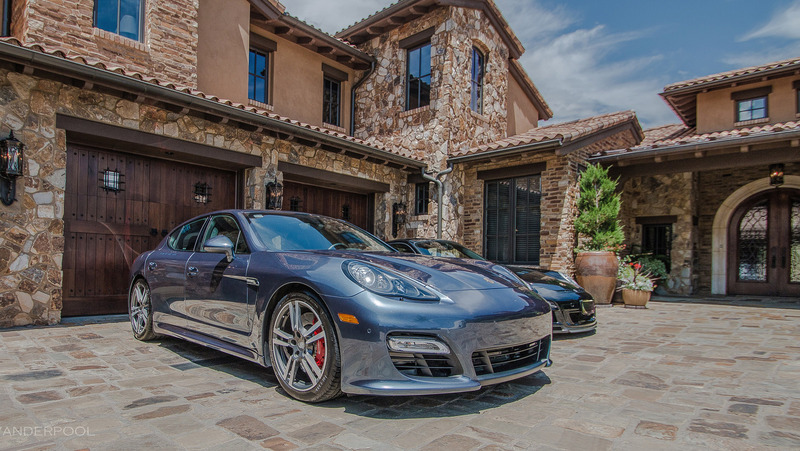 It makes up to 40% of the total production in the world. Canada generated approximately 22.5% of the total production in the world. On the third rank, comes Australia. It is responsible for 10.1% of the total production in the world. If we consider the natural resources, Australia has the most. More than 1.1 million tons of uranium can be extracted from the Australian lands. There are some doubts about the mining of this valuable mineral. Due to that, the government is not approving any new mining projects in the western part. But the projects that are already installed and functional are allowed to proceed. 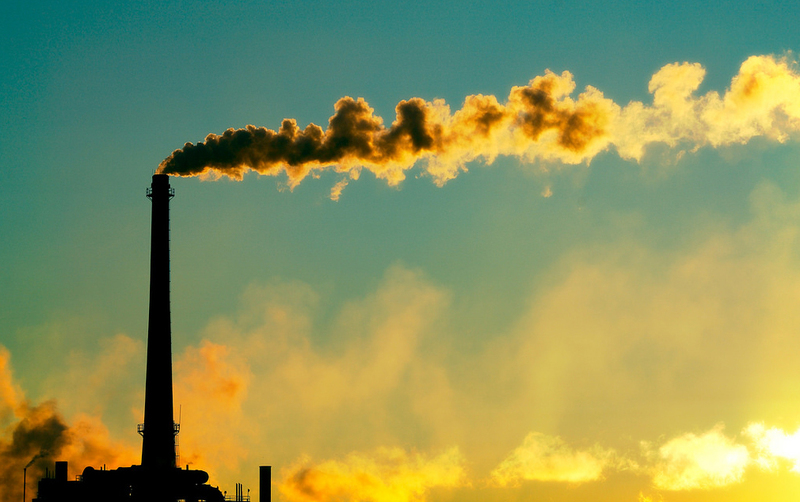 The world has more than 3.5 million tons of it. So as of now, there is no shortage.